Many people have fond childhood memories of feeding ducks at the park. Feeding some stale bread to the birds seems like it’d benefit them, too. Unfortunately, this is not the case. In reality, bread is one of the worst foods you could feed to ducks, especially if it’s cheap white bread. Nature documentaries can provide insights into the natural world and behavior of wildlife. Although often educational, they are still a form of entertainment. Reality TV shows are known for being staged but few people realize just how often nature documentaries are faked. Footage from different shoots can be weaved together to create a cohesive story. It’s difficult to track the same animals, especially over great distances. Instead, multiple animals play the roles of the various “characters”. Chris Palmer, an ex-producer of nature documentaries, writes in his book that this tactic was used in the film Whales. Throughout the film, two whales named Misty and Echo are followed as they migrate over 3,000 miles. In reality, the story was told using footage from different whales. The whales seen at the end of the documentary are not the original whales filmed in the beginning. In many cases, the animals seen in documentaries aren’t even wild. This saves the crew time and money but can also be better for the animals in question. Rented animals and premade sets can spare wildlife from extra stress, which is especially important when filming endangered species. Some shots are impossible to get without captive animals. The problem is that nature documentaries never give any indication that they’re using rented animals. The BBC used captive polar bears from a Dutch zoo in an episode of Frozen Planet. The scene, supposedly of a polar bear giving birth in the Arctic, was actually shot on a premade set. The den was built by humans, not the bear. The BBC said it was “standard practice” in nature documentaries. They defended their actions by pointing out the impossibility of trying to film a wild polar bear giving birth. The show never mentions any of this, however, and many watchers felt misled. The IMAX Documentary Wolves had a similar birthing scene and also relied on rented animals. The den was artificial and the wolves used in the documentary were all captive animals. An episode of Life used captive-bred clownfish in an aquarium for one of their scenes. In Blue Planet, a lobster spawning scene was shot using lobsters in a tank. No matter the type of nature documentary, rental animals tend to be used whenever possible. For scenes that involve animals feeding on carcasses, the film crew employs a few different strategies. The carcasses are normally planted; a nature documentary producer admitted to using road kill to lure wild animals. This isn’t always enough to entice the local wildlife, however, since most animals prefer fresher meat. Filmmakers get around this by adding treats, including M&M candies, to the planted carcasses. This can cause a feeding frenzy, encouraging animals to dig in as they look for the treats. In some cases, the animals used for feeding scenes were captive-bred. In one documentary, tame bears were directed to carcasses by their trainer. The bears were further encouraged with treats. This is much safer than filming wild bears, which could become aggressive while feeding. Unfortunately, past nature documentary fakery wasn’t always harmless. The one fact most people know about lemmings is that they hurl themselves off cliffs in an act of “mass suicide”. Lemmings do migrate and they might occasionally fall off cliff sides, drowning in the process. They certainly don’t kill themselves in droves, however. In reality, the lemmings were captive animals that had been rented by the crew. The scene was filmed in Canada, not the lemmings’ native habitat of the Arctic. As for the suicidal behavior, the film crew used turntables that pushed the lemmings, causing them to rush and eventually fall off the cliff. Thankfully, today’s documentary fakery is usually done out of convenience or respect for wildlife. In case you don’t know, the Earth is basically one giant magnet. That’s why a compass always points to magnetic North. This is extremely useful for navigation and other location based activities. Apparently, dogs also find it useful for pooping. Dermatoplyphes or “fingerprints” are common among higher primates, but are present in only some other mammals. Take whales for example. They’re mammals and they don’t have fingers (although the bones inside their flippers looks like fingers on an x-ray) but the pattern on the underside of their tail is still unique like a fingerprint. 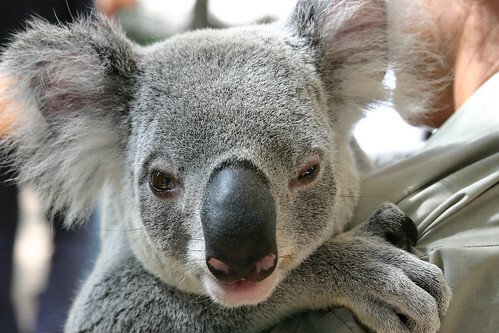 Koala’s on the other hand do have fingers and they do have fingerprints. Koala fingerprints are so similar to human prints that even under an electron microscope they’re nearly indistinguishable from each other.